You could almost equate gold and cryptocurrencies to the story of the tortoise and the hare, with the precious metal being the slow and sure participant, and Bitcoin being the rapid but volatile front runner. And if we were to track each one's distance here on March 30 we would find that in relation to the famous fable, the two are right now about in the middle of the race with the gold price having moved up for the third quarter in a row despite ending the week down a bit, and with Bitcoin's price still in the lead but now taking a nap as it has fallen by 70% over the past three months. Gold futures settled lower on Thursday, posting a decline for the week, as concerns over a potential global trade war continued to ease and benchmark U.S. stock indexes strengthened, dulling haven-related demand for the precious metal. Gold marked a third-straight quarterly gain, but it was the smallest quarterly rise in seven years. June gold GCM8, -0.03% the most-active contract, fell $2.70, or 0.2%, to settle at $1,327.30 an ounce. The contract edged down by 2.1% for the week and ended around 0.3% lower for the month of March. For the quarter and year to date, it was 0.7% higher. 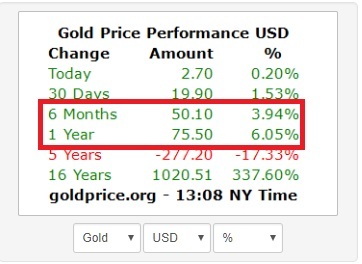 Based on the most-active contract settlement of $1,309.30 at the end of 2017, however, gold futures were up 1.4% for the first quarter and year to date—the smallest quarterly rise since the three months ended March 2011, according to FactSet data.